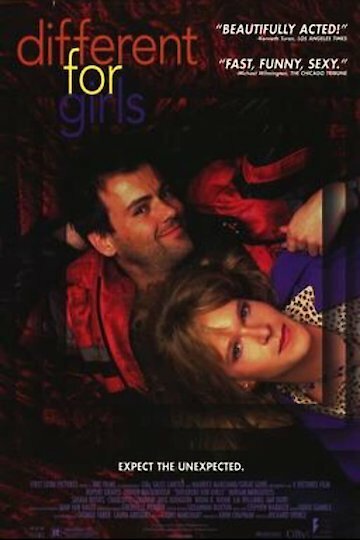 Different for Girls is a movie about two men by the name of Karl Foyle and Paul Prentice, who had good companionship in high school back in the Seventies. When they grow up and meet again in London, things are totally different. Karl is now a transsexual going by the name of Kim, and Paul is a attractive man with social discrepancies, and a job at a standstill. Getting them both in trouble is what Paul is good at, meanwhile Kim is trying to get her life together. After falling in love, Kim invites Paul to her home where he becomes frantic, and decides to publically broadcast them. The result of Paul's actions lands them in court. Kim, embarrassed by Paul's actions and is the only one to help him get out of trouble, runs away. Different for Girls is currently available to watch and stream, buy on demand at Amazon online.